In a large bowl, whisk together lemon juice, vinegar and honey. Peel kohlrabi and cut in half vertically, then slice very thinly with a mandolin. Trim radishes and slice very thinly with the mandolin. 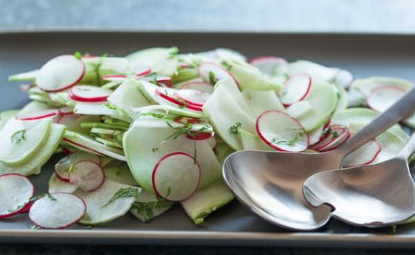 Add kohlrabi and radishes to the bowl with dressing and toss well. Add mint and toss again. Place salad on plates and sprinkle with salt. Per Serving: 70 calories (5 from fat), 150mg sodium, 17g carbohydrates, (8 g dietary fiber, 8g sugar), 4g protein.